Yordan Kostov is a Macedonian artists who dispensed with prejudice and have overcome the fear of normal creative communication. 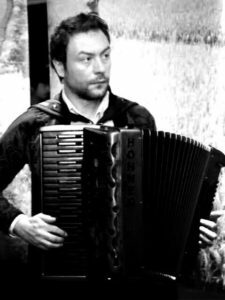 He is a versatile composer and accordionist skilled avant-garde , jazz and world musician. His music is influence from world music and same times chamber by classical middle age masters, and deeply with music from Macedonia. Ensemble moderne was one of the project supported by ministry of culture of the Republic of Macedonia as a project of national interest. Futures performing like guest in Istanbul music show on the national tv Turk, making music for shadows theatre and perform with them in São Paulo Brazil, and Chengdu China on world festivals for paapet and shadows festivals. After performing on many festivals in Balkan: Fusion ethno fest Belgrade, Spancir fest Varazdin cultural center, Thessaloniki Greece, Sarajevo jazz festival Bosnia, Jazz festival in Kavadarci, Bosh festival Gevgelija and famous Ohrid summer festival in Macedonia, its introduction for moving in Far East after invitation from Switzerland/China cultural program to initiative culture and art in Swatch Art Peace hotel in Shanghai. Also he is a founder, composer and arranger of Huangpu divers orchestra which consists of 25 musicians from diverce nationality; Paper killers ensemble; Musica kala – Macedonian reflex quartet, Revenge for the Platypus; collaborating and writing music for JZ big band is just part of his projects in Shanghai. Born in 1978 in Kavadarci, Macedonia.